The "Age of Ultron" is not over. The Avengers sequel topped the domestic box office for the second weekend in a row with an estimated $77.2 million according to Rentrak estimates Sunday. The film has earned a staggering $312.9 million in just 10 days in theaters, tying with "The Dark Knight" to become the second-fastest film to do so. While a wild success by any measure, the film is still lagging behind the record-setting precedent of 2012's "The Avengers," which made $103.1 million in its second weekend in theatres and had a domestic total of $373 million at the same point in the cycle. 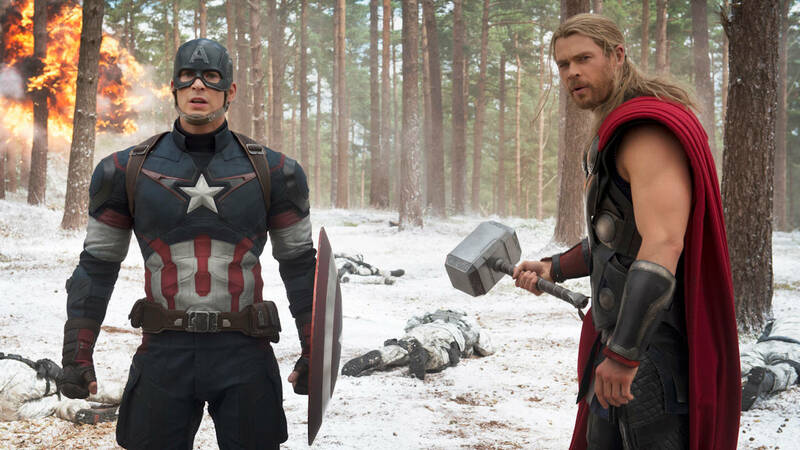 "Avengers: Age of Ultron" also added $68.3 million internationally, bringing its worldwide total to $875.3 million. The Disney and Marvel sequel opens in China on May 12 with midnight screenings. The midnight sellouts have even prompted Chinese IMAX screens to add 3 a.m. showings to their schedule. "Hot Pursuit," meanwhile, failed to make a significant mark in its debut weekend, earning a less-than-impressive $13.3 million. The Reese Witherspoon and Sofia Vergara buddy comedy, which cost a reported $35 million to produce, was projected to earn at least $18 million out of the gates. "Critics were very tough on 'Hot Pursuit,' " said Rentrak's Senior Media Analyst Paul Dergarabedian. Considering the power of female audiences at the box office, and the frequency of female-driven films to over-perform, the lagging enthusiasm around "Hot Pursuit" is puzzling. "It was a formula for whatever reason didn't resonate with the critics, and I think that had an impact on its box office," Dergarabedian said. Warner Bros. EVP of Distribution Jeff Goldstein noted that the film attracted an older and primarily female audience, which is one that doesn't necessarily rush out on opening weekend to check out a film. Audiences were 62 percent female and 82 percent over the age of 25. The Mother's Day holiday might help catapult the "Hot Pursuit" to a stronger Sunday, Goldstein said. The weekend between "Ultron's" opening and next week's debut of "Mad Max: Fury Road" and "Pitch Perfect 2" on paper seemed like the ideal spot to place a mid-budget comedy. But it's also possible that other titles further into their runs might have divided attentions, including the third-place film, "The Age of Adaline," and "Ex Machina," which snagged the sixth spot as it continues to expand. "It's a very competitive marketplace out there," Dergarabedian said. "There are a lot of cool options out there right now for entertainment in theaters." Still, "Hot Pursuit" could surprise yet, especially when it reaches the small screen. "Furious 7" and "Paul Blart: Mall Cop 2" rounded out the top five with $5.3 million and $5.2 million, respectively. Ultimately, it's still an "Avengers" world, at least until "Mad Max: Fury Road" and "Pitch Perfect 2" open next weekend. "'Ultron' is just so big. It's such a behemoth. It's hard for a newcomer to get attention," Dergarabedian said.